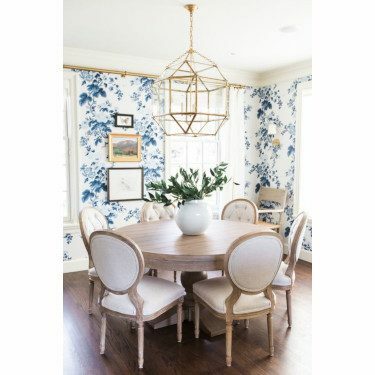 Update your dining area with a new light fixture. Whether it’s a fabulous chandelier or an industrial-style lighting, a new light fixture updates and upgrades your dining area. Don’t forget to add dimmers so you can set the ambiance during dinner parties. Mix and match your seating. This does not necessarily mean add a purple chair with a couple of blue chairs, but experiment with styles and size. Try a bench seat on one size or maybe a couple of wingback chairs for the host chairs. You’d be surprise how linens cozy up the dining area. From table cloths, to cloth napkins, to cloth placemats, and table runners, layering your table with simple designed linens adds a special touch to your dinning space. If you have large windows in the space, drape them with lush window treatments to create a more luxurious feel. Bring life to your dining room by adding houseplants and flowers. Arrange a charming succulent centerpiece or decorate with fresh flowers and house plants. Even though the dining table is the main attraction, the surrounding walls make a huge impact on the dining set. 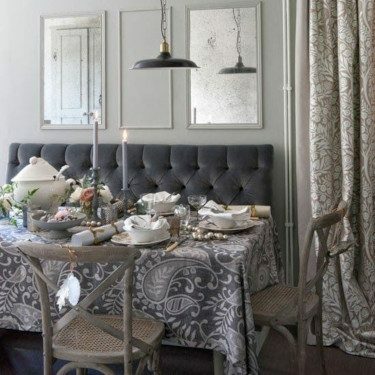 Paint or wallpaper the walls to make the dining area more cozy and inviting. Have fun with patterned wallpaper or create a romantic, moody environment with deep blues and dark greys. 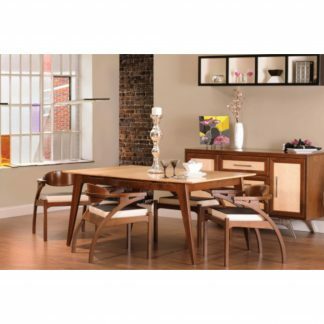 Need a NEW Dining Set? Come visit our showroom for our Fall Dining Sale happening NOW till Oct 21st.